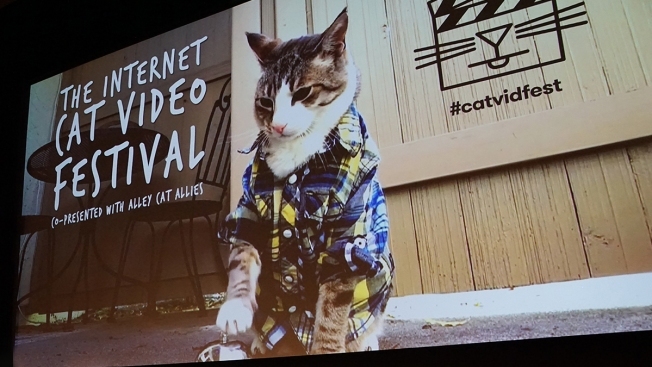 Internet cat videos have morphed into a breed of their own, and this weekend a specially curated selection of the Internet's best will star in the DMV's second annual Internet Cat Video Festival. Join a few thousand of your closest art-loving, cat-video-watching friends and head to the AFI Silver Theatre Cultural Center (8633 Colesville Road, Silver Spring) for an evening of hilarious kitty happenings. The event, sponsored by Alley Cat Allies and curated by the Walker Art Center, will feature "videos of cats playing, doing laundry, attacking boxes, hanging in Christmas trees, lounging, surprising, yawning, and generally acting lovable," according to a statement from the event organizers. If you're just as curious as we are about how they got a video of a cat doing laundry, you can grab tickets to the event on Alley Cat Allie's website for $8-$15. The 75-minute montage will begin at 5:45 p.m. Saturday and Sunday. This year's event is an encore of the 2015 screening. To create the film, curators selected the best of the best Internet cat videos from public nominations in the categories of comedy, action, drama and more.